The "Trends of Emissions and Other Indicators" document summarizes and highlights the major annual changes and notable longer-term trends of each year's GHG inventory. It provides easy-to-read graphs and explanations to illuminate California's progress in its commitment to reduce climate-changing emissions. GHG emissions from 2000 to 2016 are now available. Links to data and documentation can be found below. Carbon dioxide equivalent values are calculated using the IPCC's Fourth Assessment Report 100-year Global Warming Potential values. More information. 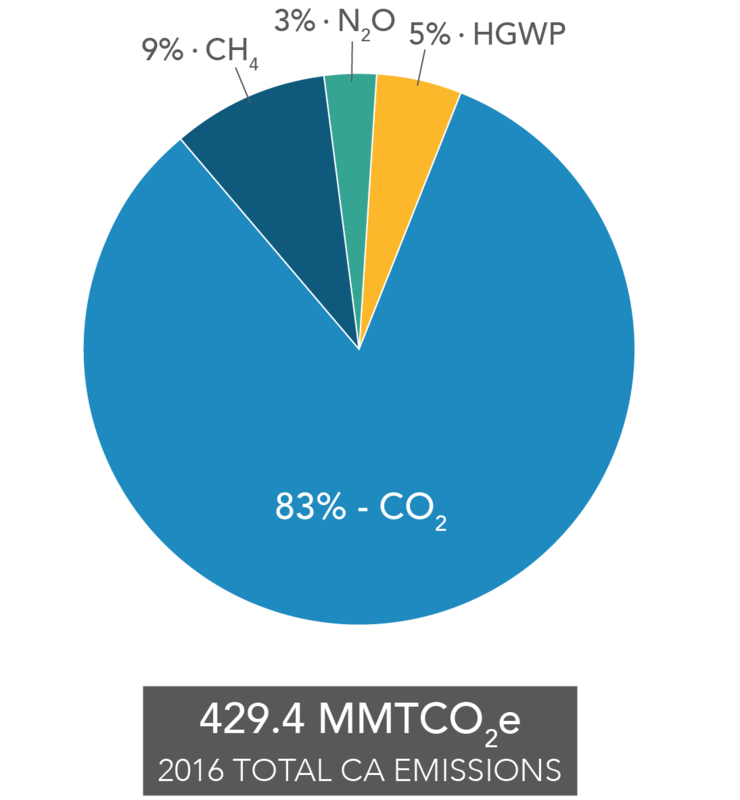 California's annual statewide greenhouse gas (GHG) emission inventory is an important tool for establishing historical emission trends and tracking California's progress in reducing GHGs. In concert with data collected through various California Global Warming Solutions Act (AB 32) programs, the GHG inventory is a critical piece in demonstrating the state's progress in achieving the statewide GHG target. 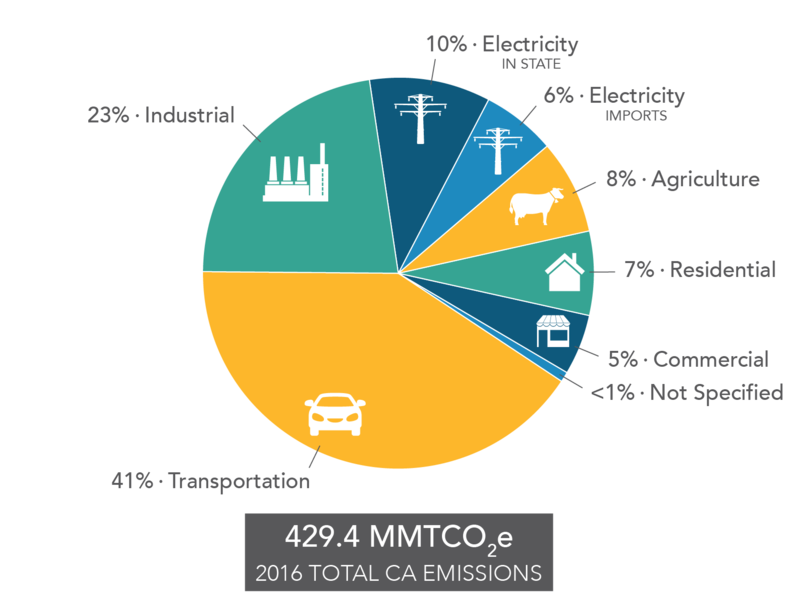 The inventory provides estimates of anthropogenic GHG emissions within California, as well as emissions associated with imported electricity; natural sources are not included in the inventory. The Air Resources Board (ARB) is responsible for maintaining and updating California's GHG Inventory per H&SC §39607.4. The inventory includes estimates for carbon dioxide (CO2), methane (CH4), nitrous oxide (N2O), and fluorinated gases with high global warming potentials (High-GWP) which includes hydrofluorocarbons (HFCs), perfluorocarbons (PFCs), sulfur hexafluoride (SF6), and nitrogen trifluoride (NF3). It uses an inventory scope and framework consistent with international and national GHG inventory practices. An updated emission inventory is published annually to include additional years and improved estimation methods. Archives of all previous inventory data and documentation are available on the archive page. Statewide emission estimates rely on state, regional or federal data sources, and on aggregated facility-specific emission reports from ARB's Mandatory GHG Reporting Program (MRR). Calculation methodologies are consistent with the 2006 IPCC guidelines. The current inventory uses 100-year global warming potential (GWP) values from the IPCC Fourth Assessment Report, consistent with current international and national GHG inventory practices. Full documentation of data sources and methods is available below or by using the detailed documentation index. In preparation for each new edition of the inventory, recalculations are made to correct errors, incorporate new methodologies or, most commonly, to reflect changes in statistical data supplied by other agencies. Emission estimates are recalculated for all years to maintain a consistent time-series following IPCC recommendations for developing GHG inventories. Thus the new inventory may report a different emission level for an earlier year than previous inventory editions. Scoping Plan; follows the categories identified in the AB 32 Scoping Plan. Economic sectors; allows for comparison with other ARB emission inventories, which are similarly categorized. IPCC process-oriented categories; follows the IPCC categorization to ensure comparability with international inventories. 2000-2016 Inventory Updates Documentation [PDF-341 KB] - documentation of updates made to the method, data, and assumptions since the previous edition. Download fuel combustion activity data. [Excel-107 KB] - Download a detailed list of all fuel combustion data used to calculate the GHG emissions by sector and activity. The categorization in this workbook matches the "Economic Sector Categorization" inventory spreadsheet above. Query the inventory by economic sector and/or by activity. This interactive query tool allows you to select a subset of the inventory, graph it or download it to your computer. Each value also contains links to detailed methodology pages. More details on the query tool's help page. The ARB Regulation for the Mandatory Reporting of GHG Emissions (MRR) is a primary data source for the statewide inventory but emissions are categorized differently in the two programs. Industrial cogeneration (also known as Combined Heat and Power, or CHP) represents the major categorization difference. The guidance document below provides instruction for working with and crosswalking between the two datasets. A spreadsheet provides GHG inventory industrial cogeneration emissions disaggregation to facilitate comparison with MRR data. GHG emissions prior to 2000 are included in the 1990-2004 GHG Emission Inventory published in November 2007 (data available in the 1990 Level & Limit section of this site). This inventory provided the basis for developing the 1990 statewide emission level and 2020 emission limit required by the Global Warming Solutions Act of 2006 (AB 32).